Polecam każdemu uzupełniać te witaminy kiedy coraz mniej przebywamy na słońcu. To już moje 3 opakowanie tej firmy i przy nim zostanę ponieważ w tej cenie nic lepszego nie znajdziemy w takich dawkach. Obowiązkowa pozycja w okresie jesienno-zimowym. Stosunek ceny do jakości 5/5. Polecam! Vitamin D3 & K2 MK7 120 caps. Up until recently, recommended dosage for vitamin D and maximal daily dosage were set on a much smaller level than now. The analysis of a lot of research shows that even the current recommended daily dosage is too restrictive. it's postulated to make the vitamin D dosage higher. This product has a higher dosage than a recommendations, but it's appropriate for scientific proof provided in the recent research. One portion is enough to cover the daily adult dosage. We don't recommend increasing the dose. Vitamin K2 MK-7 is a long-chain form of vitamin K2 (menaquinone) containing 7 isoprene residues in the side chain. It is a vitamin soluble in fats. It is usually applied to complement the supplementation with vitamin D in order to achieve the synergy of effect and reduce possible undesirable effects. It exerts the strongest influence on bones and circulatory system. The most significant role of vitamin K2 MK-7 is the activation of osteocalcin – a hormone produced by bones, which among others takes part in transporting calcium to bones and teeth. Thanks to this, it increases mineral density of bones and limits the risk of storing calcium in soft tissues, such as blood vessels, reducing at the same time the probability of developing atherosclerosis. Other health benefits are based on the possibility of testosterone level growth, thanks to stimulating Leydig cells in testicles and neuroprotective properties, protecting nervous system against degeneration and development of dementia. 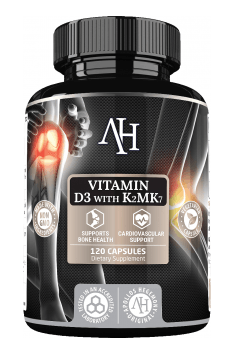 Vitamin K2 MK-7 in monopreparations, preparations combined with vitamin D3 and vitamin complexes may be found in the offer of the shop muscle-zone.pl.